China and Russia will hold two joint military drills in the coming months, military officials from both countries announced in Moscow on Monday. Fang Fenghui, Chief of the General Staff of the Chinese People’ s Liberation Army (PLA), together with his Russian counterpart Valery Gerasimov, ratified relevant documents and announced the decision at a joint press conference. Fang, who is also a member of China’s Central Military Commission, is on an official visit to Russia. 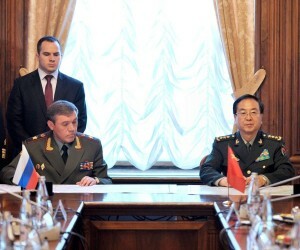 According to the two officials, Chinese and Russian armed forces will hold “Joint Sea-2013” drills in Peter the Great Bay, Sea of Japan from July 5 to July 12, and China-Russia joint anti-terrorism military drills code-named Peace Mission-2013 in Russia’s Chelyabinsk from July 27 to August 15. “The joint drills are not targeting any third party, and meant to strengthen cooperation between the two armed forces in military training, enhance their capability in coordinating military operations, so that they can play a positive role in safeguarding regional security and stability,” Fang said downplaying reports of any imminent showdown with Japan. China had expressed concerns about the joint military drill undertaken by the US and Japan in June to practise retaking remote islands even as the two Asian countries continue to face off over the disputed Diaoyu/Senkaku islands. According to a Wall Street Journal report in June, Japan had sent three warships, 730 Maritime Self-Defence Force troops, 250 ground troops and seven combat helicopters for the two week joint drill in California. Meanwhile, in a separate meeting with Russian Defense Minister Sergei Shoigu, Fang praised the good momentum of Sino-Russian defence ties. “China, together with Russia, is willing to enhance high-level mutual visits, professional and personnel exchanges as well as joint exercises between the two armed forces, so as to push forward bilateral military ties,” Fang said.